Pahawang is an island that located in the District of Punduh Padada, Pasawaran district, South Lampung. The island is divided into two Pahawang Besar or Big Pahawang and Pahawang Kecil or Small Pahawang Island. Pahawang has a lot of potential beauty, in case of scenery, the hills of green trees, white sand beaches and crystal clear sea water that will refreshing your mind. This place is also suitable for those who like snorkeling. Swimming at the beach or just playing along the white sandy beach. In Small Pahawang, there is a natural bridge called Tanjung Putus that connects Tanjung Putus Island to Small Pahawang Island. We can see Tanjung Putus during the low tide because when the water is on the high tide, this natural bridge will be under water. Tanjung Putus is also one of the favorite dive spots for the visitors that coming to Pahawang Island. Small Pahawang Island is can be reached approximately ten minutes from Big Pahawang. 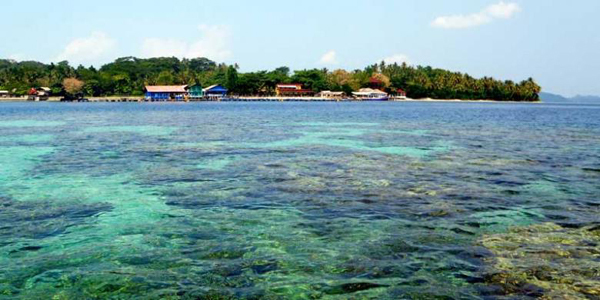 Most visitors stay at Pahawang Besar Island because this is the island that mostly local inhabitants live. It is recommended that you bring food and drinks when going to the island for lunch during the trip. From downtown of Bandar Lampung, you can head to the beach in Klara district that located in Pesawaran regency. The beach is a crossing point into Pahawang Island. The travel time from downtown Bandar Lampung to Klara Beach is about 70 to 90 minutes ride. From here you can rent a boat to cross to the Pahawang Island that costs around Rp 500,000 per day (including the driver). The boat can accommodate about fifteen people. When you rent a boat, you can also rent snorkeling equipment for around Rp 50,000 per person. The travel time to get to a location is about 90 minutes’ drive.